Unless you were born yesterday, I’m sure you’re very familiar with the English-American rock band that brought us timeless anthems such as I Want To Know What Love Is, Waiting For A Girl Like You, Hot Blooded, Juke Box Hero, and countless others. With countless hits and multi-platinum albums, Foreigner is truly one of the best and most popular rock bands in the entire world. Currently made up of Mick Jones (lead guitar), Thom Gimbel (lead guitar, rhythm guitar), Jeff Pilson (bass), Kelly Hansen (lead vocals), Michael Bluestein (keyboards, backup vocals), Bruce Watson (lead guitar, rhythm guitar), and Chris Frazier (drums), the band continues to go on concert tours (all sold out) and their hits continue to top the charts of classic albums, a mark of how great the band really is. With the leadership of English musician Mick Jones (former member of Nero and the Gladiators, Johnny Hallyday’s band, Spooky Tooth, and The Leslie West Band), the band rose to fame in 1977 with their self-titled debut album Foreigner, which earned a gold record with such hits as Feels Like The First Time, Cold As Ice, and Long, Long Way From Home. However, it wasn’t so smooth sailing when the band first started out. Mick Jones found himself stranded in 1976 following the collapse of The Leslie West Band. West’s manager, Bud Prager, encouraged Jones to continue writing songs and rehearse a band of his own in a space he had near his New York office. A series of chance encounters with keyboardist Al Greenwood and fellow Brits Ian McDonald and Dennis Elliot became the start of something that would change each of their lives forever. However, finding the right voice for their vocals proved to be very difficult as they were still unable to find the final piece, even after auditioning about 40 to 50 singers. The task of finding their lead vocals was getting harder and harder until Jones was able to unearth a Black Sheep album given to him a few years back by then lead singer Lou Gramm. Jones was convinced he had found his missing piece and immediately sent a plane ticket to New York City. Bassist Ed Gagliardi completed the new sextet and formed the band tentatively named Trigger. They released their demo tape under their new name and sent copies to numerous record companies but were passed on by all of them. But former journalist and radio programmer who was working in A&R at Atlantic Records happened to spot the Trigger tape on then Atlantic president Jerry L. Greenberg’s desk and was convinced that it was not the same band he heard previously. He was able to convince Greenberg that at least one of the songs on the tape could be a big hit and to look into signing the group immediately. The group decided to change the name of the band considering that the Trigger name was already taken. Jones came up with a name that would suit the band well. A thought came to him that no matter what country they would play in, there would be at least three band members who will be considered as foreigners (Jones, McDonald, and Elliot were all British while Gramm, Greenwood, and Gagliardi were all American). The band’s self-titled debut album was released in March 1977 and sold more than four million copies in the United States and had stayed in the Top 20 for a year. They spent a year on the road, which saw them selling out theaters, basketball arenas, and hockey stadiums. They went on to tour Europe, Japan, and Australia for the first time in April of 1978. Their second album, Double Vision, was co-produced by Keith Olsen. It was released in June 1978 and topped their first album, selling five million records and spawned hits in Hot Blooded, the title track Double Vision, and Blue Morning, Blue Day. Foreigner went on to produce ten multi-platinum albums and sixteen Top 30 hits throughout their career. After a hiatus in 2002, Jones reformed the band and selected lead singer Kelly Hansen to help write an inspired new chapter in the history of Foreigner. The band now continues to perform in numerous tours and travels from city to city, sometimes even to another country, to perform their numerous hits. Their most recent release Foreigner with the 21st Century Symphony Orchestra & Chorus immediately earned the #1 spot on the Billboard classical album chart for multiple weeks and even performed with the orchestra on tour. 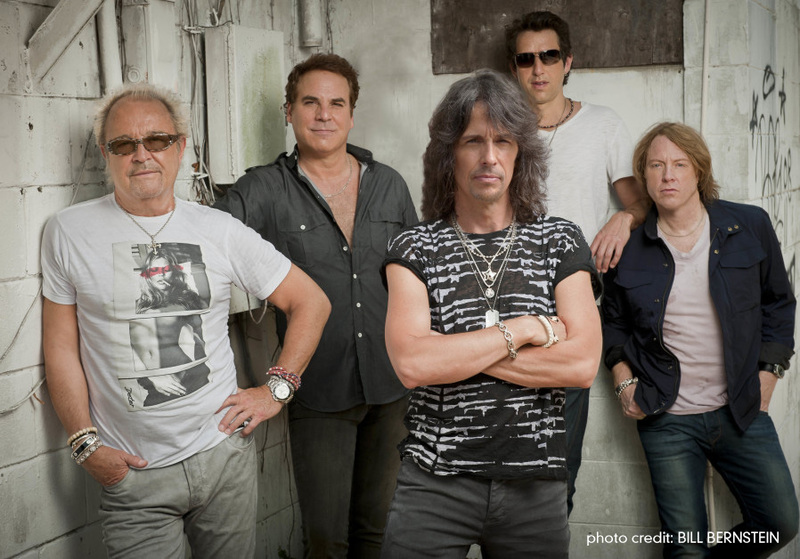 On Saturday, September 8th, 2018, Foreigner will have a concert to end celebrations at the 13th Annual Hot Springs Motorcycle Rally with a bang. Be sure to mark your calendars so you won’t miss this exciting event. Most of the events at the 13th annual Hot Springs Motorcycle Rally will be held at the Hot Springs Convention Center in the historic downtown Hot Springs.